Planet Earth, the year 2118: the 22nd century is on the horizon and the planet has evolved into one global metropolis in which skyscrapers, virtual billboards and hovercrafts dominate everyday life. 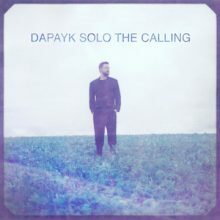 But in spite of the technical evolution, mankind’s most important philosophical question still remains unanswered: “What is the meaning of life?“ On “The Calling“ Dapayk Solo tells the story of Zoe, a young survivalist searching for answers on a digital pilgrimage, a thrilling journey from dark underground clubs to the world’s highest peaks. With this brand-new concept album the Berlin based Electronica producer takes on his most ambitious project yet. “The Calling“ is the atmospheric, danceable score to our heroin Zoe’s science fiction adventure on her personal path of spiritual enlightenment. Never before has Dapayk shown himself from such an epic and cinematographic angle.